Radio-It sure sounded like Fenway-Shipping Down to Boston, Sweet Caroline, Yooook! Replay this PM. Brandon Moss gathers none. Manny did ok. Thou shalt not walk Papi. I gotta put eyes on the field-a PAINTED warning track? PAINTED? Hey, Matt, you in that doghouse? That's no eagle. It doesn't even come close to a chicken hawk. That parrot is smarter than most Yfans-if that was Ygear-it would not be clean. Even parrots can tell a winner. Further proof that CB is indeed the MIT flunky with the subpar grade average. Would she even know how to boil water or react socially amongst actual human beings? Nope, NEVER! Here's the non-pitcher making his (or its) way in Japan, before getting a great seat in the dugout. This guy looks familiar, but I can't remember from where, given his svelte figure (that's "slim" or "thin" to MIT dropouts). Whatever happened to Manny being Manny? At least people like seeing what those strange American visitors will do (or wear) next. Run for your lives, it's Godzilla!!!! Indeed, it is the worst possible photo of mr. Bigmouth. Manny Ramirez usually starts off slowly. But this being his contract year, it appears that . . . It looks like he will be the only one. 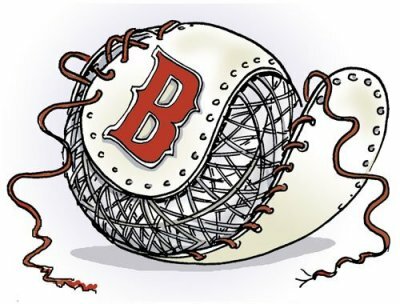 Red Sox Nation gathers million of new fans!!!! I see that Snoopy was tied with a rope....you need your mascot tied with a rope to get them on the field? And no hat or pinstripes. I don't know, holding Snoopy hostage is a bit low, even for the Yankees. Isn't that a felony? Wally though, he was shaking it at the dome. Now THERE is a properly attired mascot. Cameras at the dome=number of seats plus reporters and players. Will never forget: Manny, Papi, and all bowing-would have liked to see Schilling flat on his face. I'll bet somehow he avoided that. Papi is fine. He and Manny are taking turns for a bit. Papi had surgery, you see, after a late season last year, and of ccourse, there will be another late season this year. I think all the pitchers had trouble with those flasbulbs, the WS(-remember the WS, yfans , it has been since last century )-the WS didn't have that many flashbulbs. DiceK wears clothes that I wish Varitek would: not much, and fitting. Good man. Re Schilling-he didn't have the cojones to wear his cammies to Japan-I didn't know that Japan had Republicans! Maybe he'll miss the plane. Papelbon did not have a perfect game, so is dejected. You see, unlike other teams, the Sox are very motivated, and demand a lot of themselves. Manny doesn't run because he expects HRs. In any other park, I believe he and Papi would have had a few to their credit. Matt, you can have us all walk the plank, but you are forgetting one thing...we are protected by last October-we can walk on water. Francona is a genius-he hides his talent-which is keeping a low profile, being absolutely fair to his players, they trust him. SNOW TOMMOROW!!!!! YEE GODS. WHERE IS AN UNSMILIE FOR TEMPER TANTRUM? My post gets scolded for too many images. Gheesh. Last edited by CuriousBoston; 03-27-2008, 02:39 PM. Your post reminded me of a Shakespeare play: "Much ado about nothing"
The Japanese people are just baseball crazed. Two years ago they were wearing all Yankee caps. They just root for the most famous team that plays there. How can they love Papi after the numbers he put up? I see you had the temerity to diss Steinbrenner in Yforum, in the rename Legends field thread. You are absolutely right, but they are already at your throat. I could come and defend you, it would distract them while you hide. Last edited by Yankeebiscuitfan; 03-27-2008, 04:01 PM. I see that Ken's winter hibernation has finally finished. Your laptop keeled over, or did you figure that you'd end up in 5th place this year? Anyway, while you were gone, efin painted the place. Now if he could only sweep the place of all the rowdy regulars. We'd have to pay him triple overtime for that one! Any thoughts for the 2008 season? Now what shall we ever do about the blabbering CB? The gal has forced the elderly statesman junque dealer to have a heart attack (the big one, no less). Oh well, y'all can give up now, since your dreams are useless. You will lose. Become Yankee fans, wear the navy caps with the interlocking "NY" or risk a trifling season! Snoopy has indeed shot down the Red Baron. Oh well, I'll wait for you people to give up shortly. Your Yankee caps and t-shirts will be distributed shortly to you in the Bronx. Last edited by Mattingly; 03-28-2008, 01:32 AM. Too bad they wouldn't let me add my initial design for the visitor's dugout: "loser only" or "abandon all hope of winning, ye who enter"